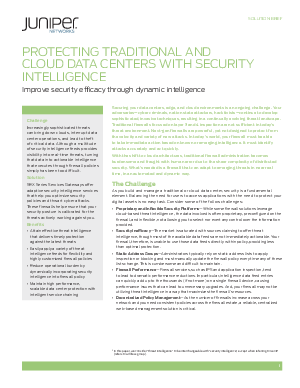 Securing your data centers, edge, and cloud environments is an ongoing challenge. Your adversaries—cyber criminals, nation state attackers, hacktivists—continue to develop sophisticated, invasive techniques, resulting in a continually evolving threat landscape. Traditional firewalls focused on layer 3 and 4 inspection are not sufficient in today’s threat environment. Next-gen firewalls are powerful, yet not designed to protect from the velocity and variety of new attacks. In today’s world, your firewall must be able to take immediate action based on known or emerging intelligence. It must identify attacks accurately and act quickly. With the shift to cloud architectures, traditional firewall administration becomes burdensome and fraught with human error due to the sheer complexity of distributed security. What’s needed is a firewall that can adapt to emerging threats in near real time, in an automated and dynamic way.